Despite having a cover that suggest another cookie-cutter goofy buddy comedy, this movie is actually quite dark in tone at times. 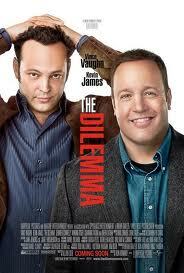 Vince Vaughn and Kevin James play friends who are partners in an electric engine design company, and in the process of working on an important project, when Vaughn discovers that his friend’s wife is having an affair. Vaughn’s “dilemma” is in trying to find an opportune time to tell his buddy. Although there are some great scenes of absurdist comedy, much of it orchestrated by Vaughn, there are equally as many scenes that venture into serious issues revolving around distrust, addiction, and friendship-loyalty. Some viewers may find that this makes the movie feel uneven, perhaps not sure of what the target audience should be. I actually thought the darker tone of some scenes gave the film a bit of weight when surrounded by so many formulaic titles in that genre, although the flaws can be problematic. I thought it felt about 20 minutes too long, and that some of the gags seemed to be much more drawn out than they needed to be. The greatest strength of the movie was Vaughn’s character, whereas James seemed more like a prop at times. 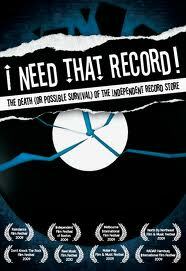 It’s not a perfect movie, but I think it will find a niche of fans who see it as a refreshing take on the genre. Fans of co-perative based shooters have reason to celebrate. 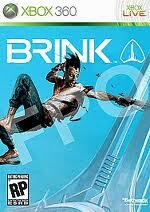 On May 7th, the game Brink is quietly going to hit shelves, and may end up being the sleeper hit of the year. Everything in the developer videos suggests that a lot of work has gone into priming this as something refreshing and unique. Not since the original Left 4 Dead has a game shown the potential for offering REAL cooperative gameplay. The developers have promised that this will be THE game for everyone who hates the “lone wolf” style of Call of Duty games. Working as a team will be the only way to succeed when playing Brink. Objectives all require a combination of skills by all four classes in order to be met. For more great information, take a look at the videos below. The Resident is one of those movies built on the old archetype of putting a vulnerable, unsuspecting woman into a situation where she becomes victimized by a mentally or emotionally unstable villain. And while this film starts out well, steadily building tension in the first half, the second half sputters and becomes a mish-mash of cliches and a fairly standard cat-and-mouse chase scene. Hilary Swank and Jeffrey Dean Morgan (who reminds me of a more mature, less hyper-kinetic Robert Downey Jr.) play the two leads. Both are good actors, and do the best they can with the script they’ve been handed. One of the problems with the movie is that so little information is given to provide insight into Morgan’s character. His grandfather, played by legendary horror film actor Christopher Lee, offers hints into Morgan’s unstable family line, but much of this goes unexplained. By the end, Lee’s character seems more incidental, perhaps added to the cast just to give the film more credibility. Maybe I’m being too much of a nit-pick. In fairness, the movie isn’t trying to be anything more than what it is. 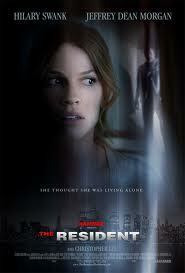 Fans of the suspense-thriller genre will probably watch it and be entertained. For those who are not, I doubt there is much here to win you over. Based on the play by David Lindsay-Abaire, Rabbit Hole succeeds almost entirely because of the performances of Aaron Eckhart and Nicole Kidman. As parents of a child who was killed in an accident recently, they have to run the gamut of emotions through almost the entire film. When the film begins, you are introduced to the couple. Judging by the lighthearted interaction between them, you aren’t really sure if this takes place before their child dies or not. The performances continue to be elusive throughout the first half of the film, and only gradually begin to venture into conflict as the couple struggles to find healing, both individually and together. In a heartbreaking sub-plot, Nicole Kidman’s character confronts and befriends Jason, the teenager who was driving the car that killed her son. The guilt Jason carries with him is enormous, and in a striking bit of irony, she finds her own search for healing actually begins with helping him deal with his own guilt. A fine bit of acting with a crisp script that engages viewers despite limited action. Recommended. There will be two reactions to this movie. Those who like it probably haven’t read the Swift classic, and just want a bit of mindless family fun. These are also people who can put up with Jack Black acting like…well, Jack Black. I’m sure kids will get a kick out of the gags. Personally, I think Jonathan Swift’s original novel is one of the greatest satires in the English language, and to see it reduced to matinee fare is a bit depressing. More watering down of great literature just to make it accessible to the masses. Ugh. Just had to get that off my chest. For a movie that had the premise of a Hallmark Movie of the Week, this one came off remarkably well. Based on a novel by Karen Kingsbury, the story is basically about a couple’s attempt to reclaim their six year old son from the couple that adopted him. While there were a few moments that veered into sentimentalism a bit too much, the story was actually pretty powerful. Most of the credit has to go to the cast. 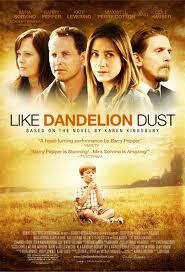 Barry Pepper, playing the birth father, who is also an ex-con with anger issues, puts in one of his best performances. The sense of simmering rage, barely held in check, by his character, is incredible. I also thought Cole Hauser, playing the adopted father, was excellent. 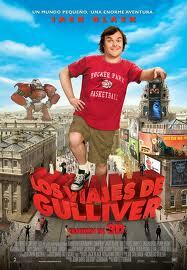 I really don’t know why some of these types of movies work, and some become forgettable slop. There’s nothing entirely unique about the story, but the way it all comes together just seems to work. Considering the amount of press and buzz surrounding The King’s Speech, the last thing the internet needs is another review for it. Suffice it to say that I felt all the attention was more than deserved. The film was as much, or perhaps more, about the friendship between Lionel Logue and King George IV. It was an unlikely friendship, considering the worlds each man occupied. 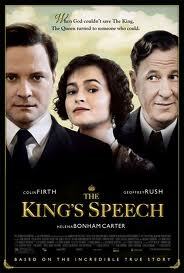 The acting by Firth, Rush, and Bonham-Carter is simply unbelievable. 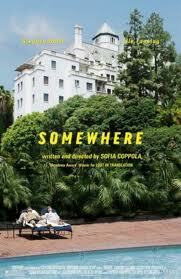 And the script is a work of near-perfection, balancing dramatic heartbreak with generous doses of wit throughout. One doesn’t have to be a student or enthusiast of history in order to appreciate this film, mostly because it cuts through the grandeur of epic events and finds a very human center. Easily one of my favorites of the year.